Salvation And Survival: If Only We'd Paid Attention! If Only We'd Paid Attention! I sometimes give myself the luxury and joy of watching the old TV Westerns that AMC shows on Saturday mornings. It takes me back to my innocent childhood; that time when I was unaware of the sinister plots underway that would forever change the direction of this country. This past Saturday, I turned on AMC while cleaning up the kitchen after breakfast. 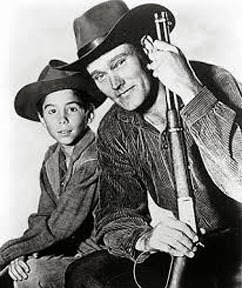 I smiled to see that the selection this morning was an episode of The Rifleman. That just happened to be one of my father's favorite shows, and I remember sitting at his feet and trying to count how many times Lucas McCain fired his lever-action repeating Winchester '94. I never was quite sure whether it was 14 or 15 times. This was a particularly early episode; I was only 7 when it originally aired and couldn't remember the plot. I was vaguely aware that it had something to do about a prison wagon of criminals who took over the town, until Lucas called the leader out and regained control of the situation. Typical "Lucas to the rescue", I thought. So it played in the background as I finished loading the dishwasher. Just as I went to turn off the TV, it was at the end of the episode when programs of that era gave the audience a little life lesson to chew on. This time it was an exchange between Lucas and his son, Mark, that caught my ear. I want to share it with you, because it has such great implications for today. Mark: Pa, those men could have taken the town away from us, couldn't they? Lucas: They could have taken it physically, but they couldn't have kept it. It takes more than guns to hold a town. No, son, the only time a town, or even a country, is really lost is when the people livin' there get careless how it's being run and stop paying attention to it. Mark: You mean like the Roman Empire? We're learnin' about that in school. Lucas: Then you know the value of studying your history. And you were 100% right, son, when you said "like the Roman Empire." By knowing the mistakes people made hundreds of years ago, we can learn a lesson and profit by not making the same mistakes ourselves. Then Mark furrows his brow, deep in thought, and says, "Well, I hope so....". Then you hear that sound effect that indicates something ominous on the horizon, and Lucas stares off in the distance, clenching his jaw, as the screen fades to black. I was amazed that a 1960's-era TV show had captured exactly what we have allowed to happen. Pure and simple ... we got careless about how our country was being run. And what has been the result? Exactly as young Mark conveyed; we have become the Roman Empire. But did we learn from history? Apparently not! Just like Rome we are suffering religious discord; financial and political ineffectiveness; and the end of an effective field army. The abuse of power by Roman leaders eventually led to civil wars and the disintegration of the Empire. At the moment, our civil wars are limited to wars of words over policies and ideologies. Let us pray that they don't become more than that. But we have obviously not learned our lessons from the mistakes made in the past. Just like Rome, we have become comfortable in our state of prosperity and smug in our self-proclaimed invincibility. And we stopped paying attention. 1 Corinthians 10:11 "Now these things happened to them as an example, but they were written down for our instruction, on whom the end of the ages has come."